Honeydew melon growing vertically on a wire fence. Vertical gardening is growing plants on a support such as a stake, trellis, cage, or fence. Pole beans, peas and tomatoes are commonly grown this way. But other vining crops such as cucumbers, squashes—both summer and winter, and melons can also be grown vertically. Many vining crops will climb vertically by themselves using twisting tendrils to grasp the support. Others may require twist ties or string to help them grow up. • Save space. Vertical vegetable gardening saves space. Cucumbers, melons, pumpkins, and squash require a large amount of ground space. One untrained cantaloupe will crawl over an area of 16 square feet. The same melon trained vertically will take only one or two square feet of ground. • Avoid pests and disease. Slugs, snails, and other pests can easily attack crops growing on the ground; it is much more difficult for them to climb trellises or strings. Crops growing on the ground come in contact with wet soil which can cause rot or disease. • Fruit appearance. The fruit of cucumbers and squash grown vertically hang down and grow straight with the pull of gravity. Fruits will grow longer and straighter. • Protection and garden beauty. Vertically growing vegetables leaf out across the support. Masses of leaves protect ripening vegetables from sun and wind burn. A leafy trellis or fence can shield the garden from prevailing breezes and block out unwanted views—of neighboring property or compost piles. Set vertical supports to the north side of your planting area so that they do not shade shorter, smaller crops. Beans: pole beans produce throughout the season (bush beans mature all at once, and then stop). Cucumbers: All varieties of cucumbers can be grown vertically. You can prune cucumbers to a single stem or prune them to the branches growing toward the vertical support. Cucumber grown vertically will grow longer and straighter. Melons: All melons can be grown vertically (except watermelons) without support for the fruit. Be sure to pick ripe melons before they slip from the stem. Melons also can be attached to the support with a net or sling. Peas: Peas are a spring crop. Space them just 2 inches apart and train them up chicken wire or a fence. When the vines dry up, replace them with beans or squash or any other vine crop. 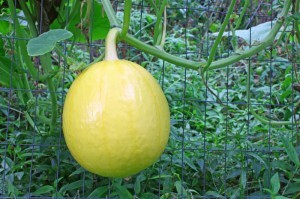 Summer squash: Summer squash will form fruit along the length of the vine when grown vertically. Tie summer squash in at about 1 foot lengths. Tomatoes: Indeterminate or vining tomatoes that keep growing long from the tip of the vine (unlike determinate or bush tomatoes) will grow on any vertical structure including strings. Tomatoes are commonly grown vertically in cages or on poles. Winter squash: All winter squash can be grown vertically without support for the fruit, except the large and heavy Hubbard and Banana squash.